Botany as a subject was introduced in Nepal for the first time in 1947 with the introduction of biology at Intermediate of Science level at Tri-Chandra College in Kathmandu. It was upgraded to Bachelor level in 1950 and to post-graduate level in 1965. The initial post-graduate classes at Tri-Chandra College had eight students. The Department moved to Kirtipur in November 1967 (13 Mangsir 2024 BS) and was upgraded to the Central Department of Botany (CDB) in 1987 for M.Sc. and Ph.D. level studies, and to strengthen research on plant science. CDB is responsible for all academic programs of botany within TU. As the primary institution of higher education in botany, CDB has played an important role for five decades, producing the skilled personnel and experts in botany. CDB has also undertaken fundamental and applied research exploring Nepal’s plant wealth and establishing intricate relations between plants, people and environment. The mission of Central Department of Botany (CDB) is to foster an environment of excellence by attracting and supporting the outstanding students, faculty and staff needed to sustain our vision. We focus on the patterns and processes that enable predictive understanding of plants and their environments at local, regional, and global scales, leading to strengths in the areas of ecology, evolution, and systematics. Central Department of Botany, Tribhuvan University is a pioneer institution in the country for promoting research and academic courses in plant science to produce high level human resource. The post graduate teaching in botany in Nepal started from 1965 at Tri-Chandra College and then moved to Kirtipur in November 1967 (Mangsir 13, 2024 B.S. ), it is upgraded as Central Department in 1987 to strengthen research in plant science. Annually, the Department graduates about 35 post graduate plant scientists with specialization in Plant Systematics and Biodiversity, Ecology and Resource Management, Plant Pathology and Applied Mycology and Plant Biotechnology. Aiming to understand biodiversity conservation and development theory, to develop an advanced knowledge on biodiversity, development policy and management of biological resources, the Central Department of Botany (CDB) has started a Master Level program on Biodiversity and Environmental Management (BEM) since 2008. In addition, the department runs a very successful Ph.D. program from where 43 scholars have been already awarded and more than 20 scholars are presently involved in Ph.D. research. The department also has a research based culture with several collaborating research projects funded by national and international organization. Almost all faculties’ members have their Ph.D. degree. The department annually publishesa journal of plant science (Botanica Orientalis) and a newsletter (Vanaspati) in addition to occasional research books to disseminate research findings and its academic activities. The department also organizes national and international conferences, seminars and workshops and colleagues regularly publish research papers in different reputed peer reviewed journals. Students are supporting the Department for the betterment of the academic environment through Botanical Students Association (BOSS). The main challenges of the Department is space constraints due to heavy damage and destroyed of main building by the earthquake of 2015, however, a limited new infrastructure has been created and a two stores new building is planned. Tribhuvan University has approved the plan of new building and hope the Department will be recovered space problem soon. We admire the contribution of our former and present faculties, TU authorities, collaborating partners, non-teaching staffs and students to establish a lead Department in Tribhuvan University. We look forward for their continuous cooperation and collaboration for making this department as a center for academic excellence. 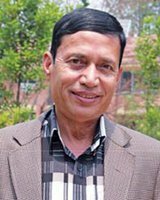 I express my sincere thanks to all colleagues, especially to Prof. Dr. Sangeeta Rajbhandary, Prof. Dr. Ram Kailash Prasad Yadav, Prof. Dr. Bijaya Pant and Dr. Suresh Kumar Ghimire for their continuous contribution for compiling and editing the Prospectus. Aggregate marks in their B.Sc. (20%). Candidates holding a two to three years Bachelors degree plus M. Sc. Degree or four years Bachelors degree in Biological Science (Botany or Zoology or Microbiology or Genetic Engineering or Environmental Science or Forestry ) from an accredited university are eligible to apply. Central Department of Botany (CDB) provides scholarships to the needy and deserving students. Scholarships are provided depending upon the student’s academic performance, class activities and academic progress.